Release Date: October 21st, 2005 (NYC-Quad Cinema) by New Yorker Films. BASIC PREMISE: A documentary about wrongly convicted prisoners who are freed by new DNA evidence. 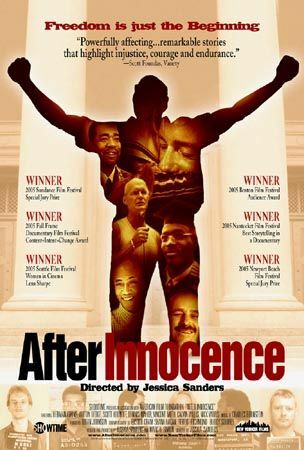 ENTERTAINMENT VALUE: After Innocence hooks you from the very beginning by the personal interviews with each wrongly-convicted prisoner. Larry Scheck and Peter Neufield, the lawyers who founded the Innocence Project in 1992, fight hard to prove the complete innocence of these prisoners. It’s concurrently riveting and frightening to find out just how much corruption there is in our justice system. The prisoners served many years in jail—some are even on death row. However, once they are released, their life is never the same. They can’t easily find decent jobs and lose many friends. The prisoners provide many details about their case to paint an accurate picture of what they had been through before their arrest. Director Jessica Sanders does a great job of showing the importance of the Innocence Project without hammering it over your head. The suspense gradually builds up each prisoner’s final verdict. You truly end up caring about the prisoners as well as every wrongfully-convicted prisoner throughout the world. SPIRITUAL VALUE: The most moving and heartbreaking scenes are when the prisoners are reunited with their family. They cry with joy and feel like a burden has been taken off their backs. However, it’s easy to be angered by the time they wasted in jail for a crime that they had never committed. Even the prosecutors share some regret and sadness over the unreliable justice system. This film also stresses how difficult and deceptive it is to rely on witness accounts no matter how certain the witnesses are about they had seen. By the end of this film, you wonder many other prisoners there are out there who don’t truly deserve to be in jail. THE BOTTOM LINE: A powerful, smart, compelling, and a tremendously moving experience. It’s a real triumph for director Jessica Sanders!